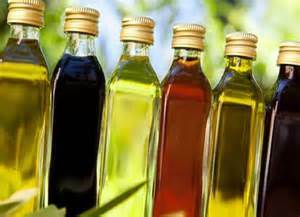 Vegetable Oils – Vegetable oils (and margarine, made from these oils) are oils extracted from seeds like the rapeseed (canola oil) soybean (soybean oil), corn, sunflower, and safflower. They were practically non-existent in our diets until the early 1900s when new chemical processes allowed them to be extracted. Vegetable oils are manufactured in a factory, usually from genetically modified crops that have been heavily treated with pesticides. Unlike butter or coconut oil, these vegetable oils can’t be extracted just by pressing or separating naturally. They must be chemically removed, deodorized, and altered. These are some of the most chemically altered foods in our diets. Vegetable oils are found in practically every processed food, from salad dressing to potato chips to mayo to conventional nuts and seeds. Today, people consume, on average, about 70 pounds of vegetable oils throughout the year! Anytime you cook a food, you run the risk of creating heat-induced damage. The oils you choose to cook with must be stable enough to resist chemical changes when heated to high temperatures, or you run the risk of damaging your health. One of the ways vegetable oils can inflict damage is by converting your good cholesterol into bad cholesterol–by oxidizing it. When you cook with polyunsaturated vegetable oils (such as canola, corn, and soy oils), oxidized cholesterol is introduced into your system. As the oil is heated and mixed with oxygen, it goes rancid. Rancid oil is oxidized oil and should NOT be consumed–it leads directly to vascular disease. Trans-fats are introduced when these oils are hydrogenated, which increases your risk of chronic diseases like breast cancer and heart disease. Instead, whenever I cook, I use either butter or coconut oil. Coconut oil is practically 100% saturated, which means it is stable at high temperatures. It also is very beneficial to the health of your body.